ALZETA® pioneered premixed, surface-stabilized combustion with the fibrous ceramic Duratherm™ burner, commercialized in 1985. At the time, its characteristics were unique in the burner industry. It delivered very uniform heat distribution, low NOx, extremely low noise, and very rapid response to load changes. Although early projects included firetube boiler burner retrofits and large-sized condensing warm air furnaces, the first commercial applications were for heating “fragile fluids” such as asphalt and organic synthetic heat transfer fluids. ALZETA’s strong background in combustion engineering led to the patented “Radiant-Cell Cabin Heater™”, and burner systems for immersion tubes in asphalt tanks and oil-field heater treaters. These applications continue today, as the need for distributed, uniform, radiant heat and “flameless” combustion greatly minimizes the chance for coking or process fluid breakdown. “Flameless combustion” is one of the key benefits of ALZETA’s ceramic burner material. The high surface area of its fibrous construction promotes rapid combustion reactions, such that there is no visible flame extending from the surface. 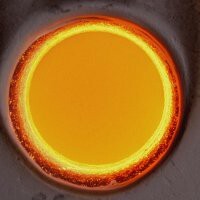 The surface glows orange at about 2000°F, with unsurpassed radiant heat transfer for a gas burner. Hence the Duratherm™ ceramic fiber burner is ideal for close-coupled heat exchangers as there will be no flame impingement on the heat exchanger. Overall surface heat flux ranges from 20,000 to 150,000 Btu/hr-ft2 depending on application. ALZETA can provide designs in almost any configuration with a fabricated metal support, and single, multi-segmented burner capacities to 10 MMbtu/hr. In premixed surface combustion, all flow must pass through the surface. Taking advantage of this, ALZETA developed “flameless oxidation” for VOC abatement. The rapid combustion along the surface is effective in thoroughly destroying difficult, halogenated VOCs, and by having all flow pass through the surface, every VOC molecule is exposed to the high temperature flame zone. For some of these difficult compounds, destructions of 99.9999% has been demonstrated. Oxidation performance is further enhanced by turning the burner “inside-out”, such that flow penetrates the cylindrical surface from the outside in. An oxidizer using this design has no exterior refractory or insulation, simplifying construction and permitting very rapid response. Systems can go from cold, to ready-for-oxidation in only a few minutes.